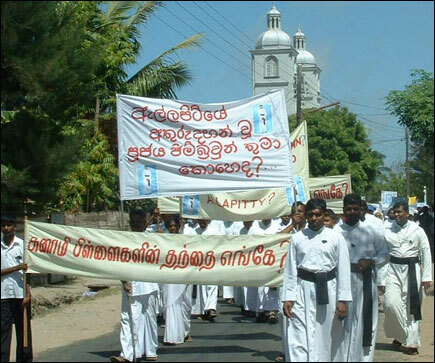 A silent protest march was held Friday morning in Mannar town demanding the release of the disappeared Allaipiddy Parish Priest Rev.Nihal Jim Brown. 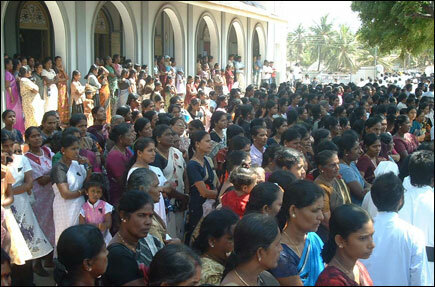 The march began around 10.15 a.m. from Mannar St.Sebastian Church arrived at Mannar District Secretariat building at about 11 a.m. About six thousand people including the Head of the Mannar Diocese and Parish Priests of Pallimunai and Mannar and other several priests, nuns numbering about seventy five and parliamentarian Mr.Vino Noharathalingam and representatives of EPRLF (Suresh Wing) and TELO and other humanitarian and civil rights' groups participated in the march carrying placards with the photograph of missing priest. A memorandum addressed to President Mahinda Rajapakse was handed over to Mannar Additional District Secretary Ms Mohanathan by the Head of Mannar Diocese. Copies of the memorandum were handed over to representatives of the Sri Lanka Monitoring Mission, and Human Rights Commission of Sri Lanka based in Mannar. Thereafter the silent march proceeded to the office of the Mannar office of the International Committee of Red Cross (ICRC). Representatives of the peace march handed over a copy of the memorandum to ICRC delegate there. Earlier on the day a special mass was held in the St Sebastian Church. In support of the silent protest march shops in Mannar town were closed till Friday afternoon. Fishermen did not go for fishing. 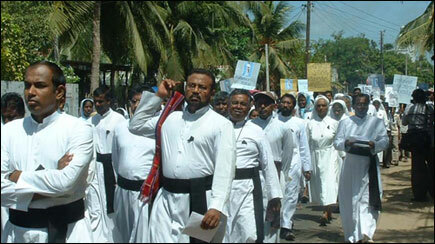 07.04.07 Punguduthivu body may belong to Fr.Brown, say Jaff..